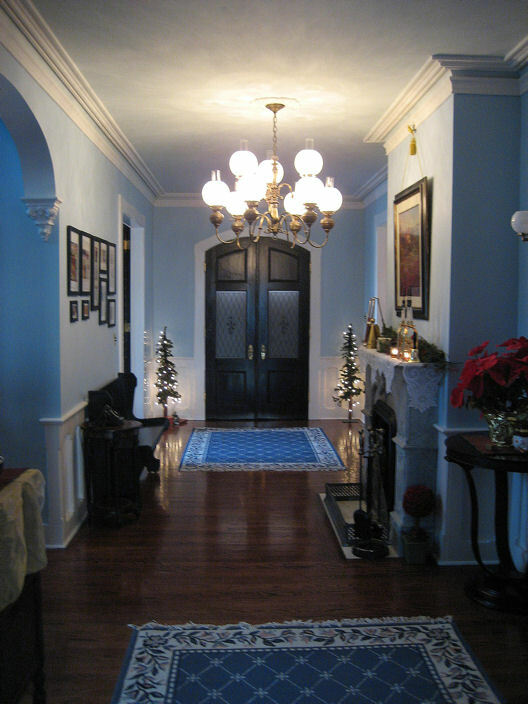 The Reception Hall is one of the most important rooms in the house. It not only gives the first impression when you walk in the front door, it gives the biggest one. 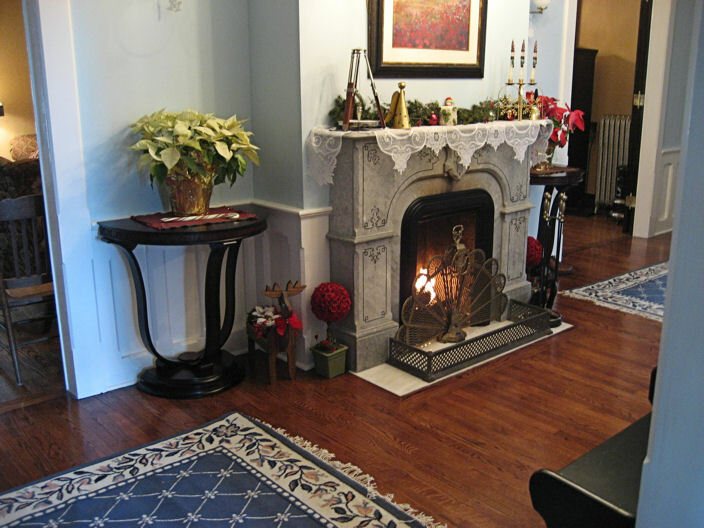 It is a sprawling 9 X 30 with a carved marble fireplace. 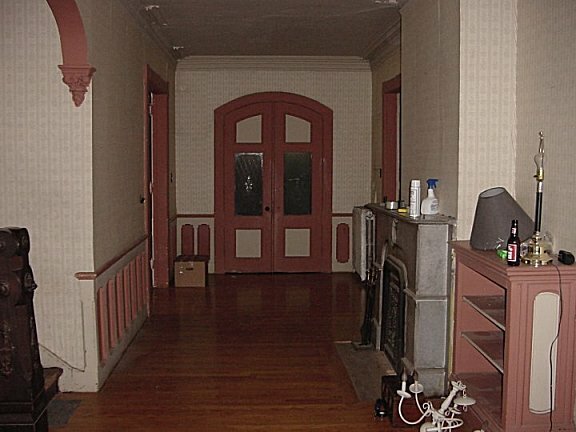 This room has some major "Wow!" factor. 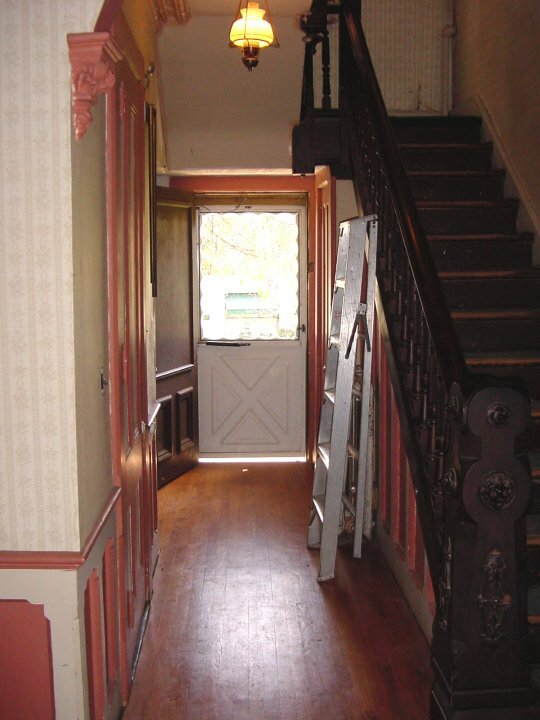 Numerous pairs of 8-foot doors fill this wonderful hall with entry points to the rest of the house. 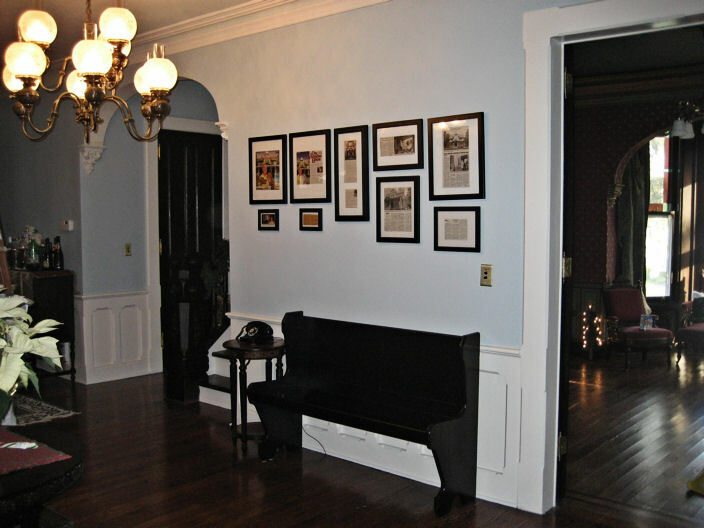 In the 1800's, this is where the guests would mingle before being seated for a formal dinner. 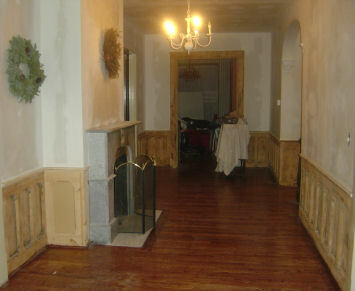 This room is simply full of old style charm that needs to be restored back to it's original grandeur. There is so much work going on in this hall, this page is going to be lengthy. Use these links to get to the stuff you really want to read about. 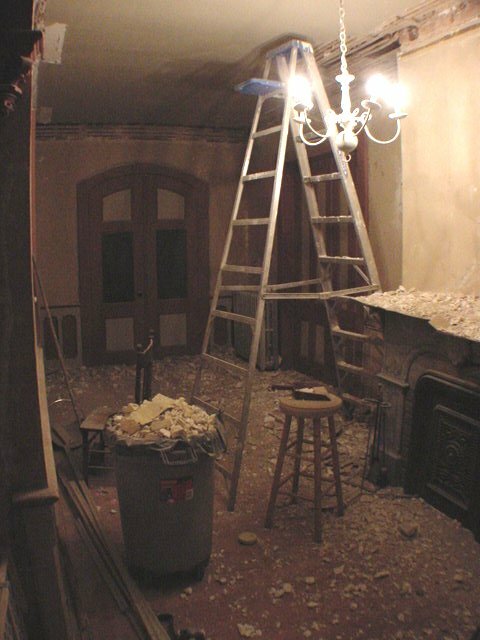 This photo shows the large missing pieces of plaster molding. Here is where someone tried to make a repair. In this corner, the ceiling is actually separating from the lathe and barely hanging on. 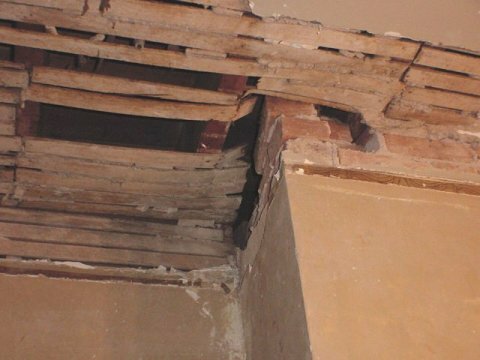 Well, after consulting with a few contractors, and restoration specialists, we came to the conclusion that the ceiling has to go. The damage is entirely too extensive to repair. 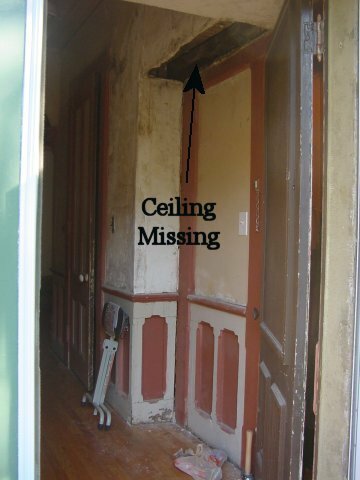 In addition, the ceiling is completely warped from the house settling over the years. 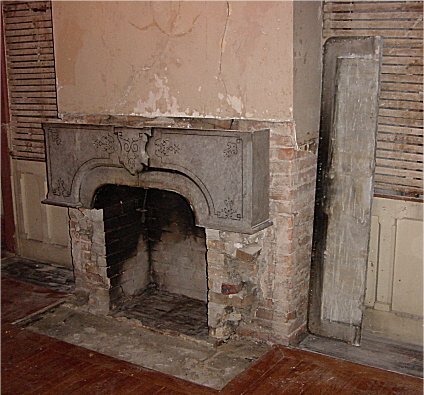 It appears that the front and rear sections of the house settled by about 3 inches or so, but the chimneys didn't budge. 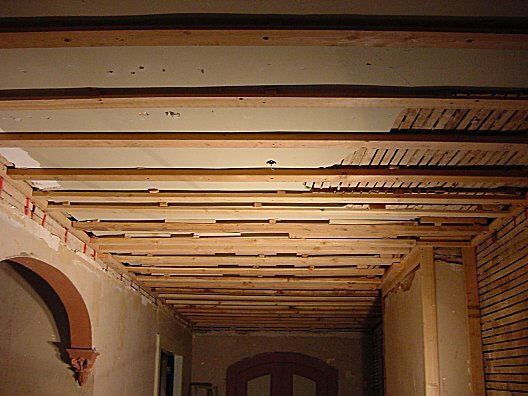 The hall ceiling has joists that span all three areas. 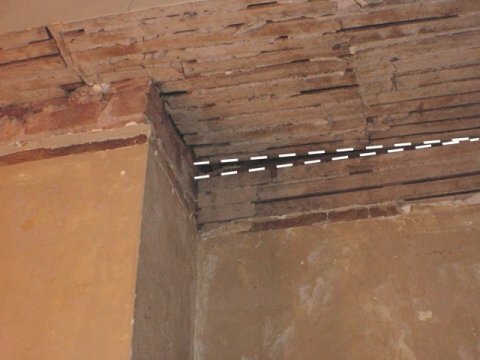 In short the ceiling and moldings have been slowly torn apart over the years. 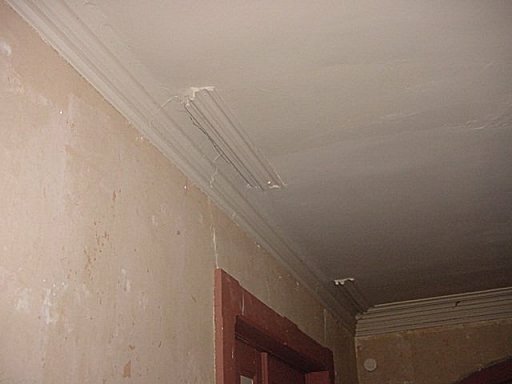 The only remedy is to remove all of the remaining plaster moldings. Ouch! This is not what I wanted to hear, but after studying the problem, I decided the experts were right. Very sad. 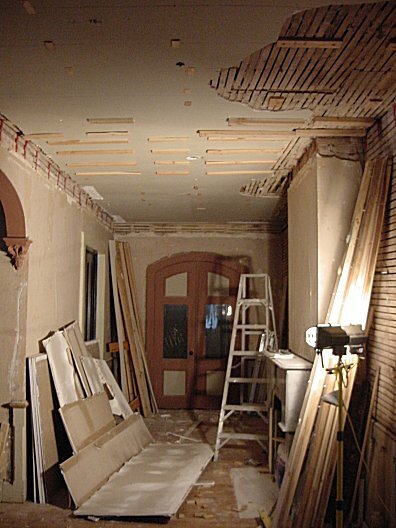 I decided that the best remedy was to indeed remove all of the plaster moldings from both the walls and ceilings. This was incredibly difficult! The ceiling molding came down by blowing on them, but the wall moldings took a sledge hammer and chisel. The dust that kicked up was beyond description. A rather large section of ceiling fell on me taking me clean off the ladder. No fun. 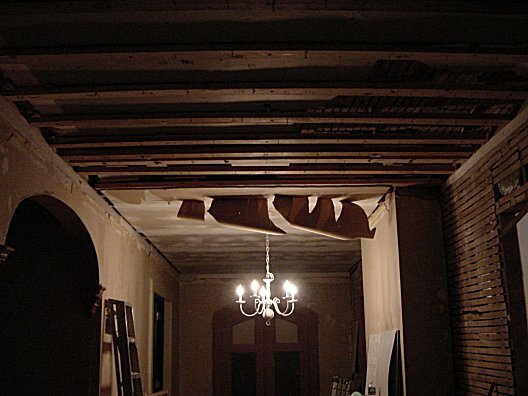 I proceeded to remove the remaining loose portions of ceiling leaving the stable sections in tact. Here is a closer look at how the settling happened. 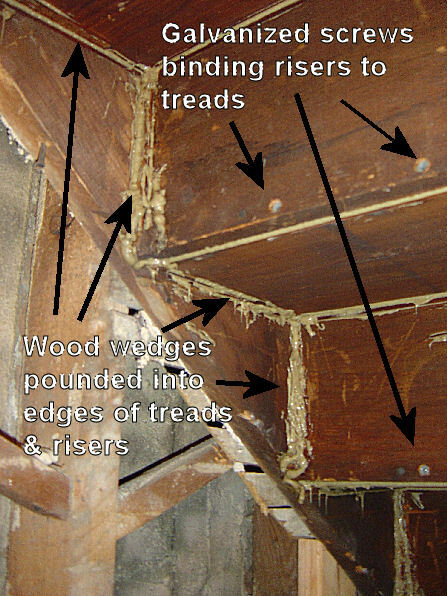 The dotted lines show how the wall sank but the chimney remained in place, literally splitting open the wall and moldings. Now, I know I did the right thing taking this all down. The ceiling can now be completely re-leveled. On the other side of the chimney you can see how the lathe actually bent upward over time as it tried to hang on, eventually breaking free. 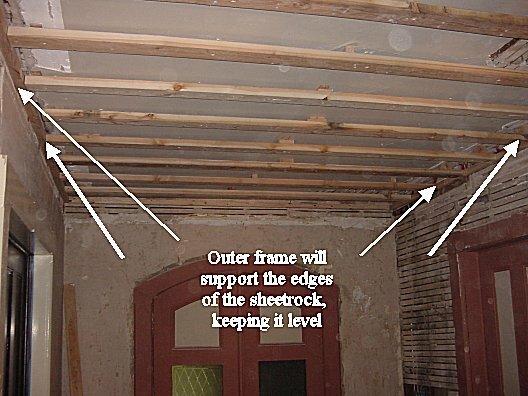 Due to a century of settling, the old ceiling was actually five (5) inches higher in the center of the room over the fireplace than on either end of the hall. 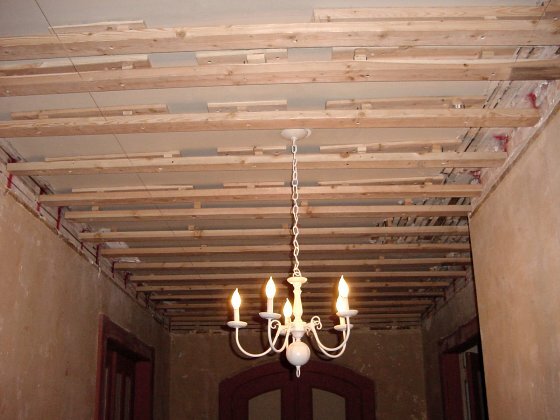 The solution was to build a frame on the ceiling that compensates for the varying heights of the joists. 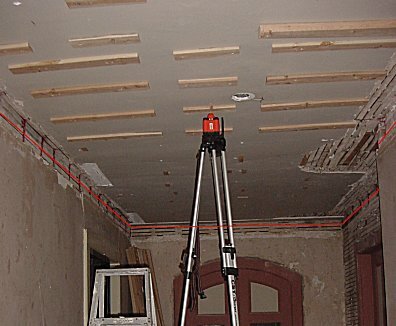 This was accomplished by custom fitting 23 beams, each one with special spacers that would ensure that it remained level. 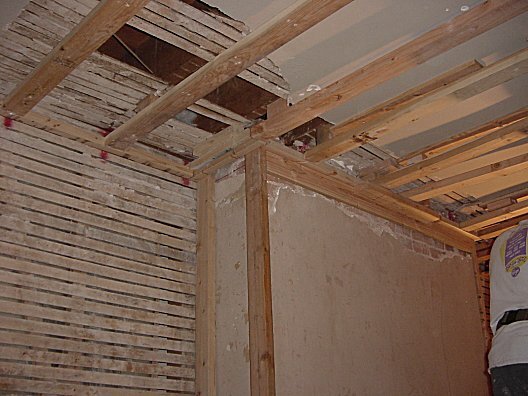 Each beam was mounted with five 4" countersunk bolts that were driven into the existing joists. The result was a perfect, level surface to mount a new ceiling. 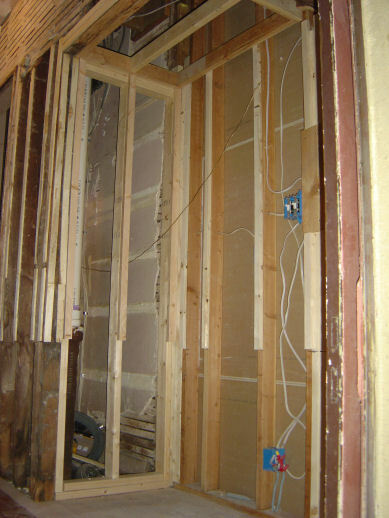 I did not run a frame around the perimeter to attach the edges of the sheetrock to. Over the coarse of time, the unsupported edges became slightly warped and uneven. 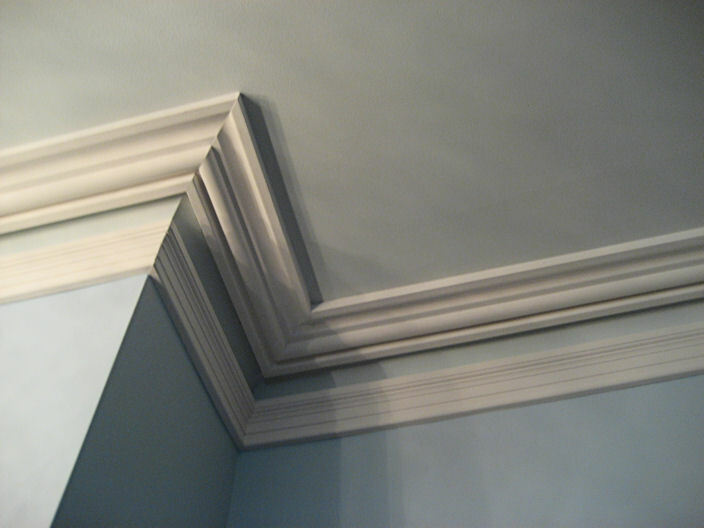 The warping was not really noticeable from the floor, but would have shown up when cove moldings were applied to the uneven surface. The bottom line is, it all has to come down and be built over again. That blows big time, let me tell you. So, about a year after it was put up, I sank a few cold ones and started tearing everything back down again. It was almost a relief once it was down. I now knew what I had to do to get this done the right way, it was just a matter of doing it. The good news was that the lumber was all re-usable so the mistake had a very low material cost, just lots and lots of labor. Once again it's our old friend Mr Spinning Laser Leveler. I set the correct height and switched her on. Using a marker, I drew a perfectly level line all the way around the room. This is where we mounted the perimeter frame to the walls prior to installing the beams. Next we simple mounted the beams, level with the frame, using shim blocks for support. Each beam was checked and double checked for level prior to mounting into place. 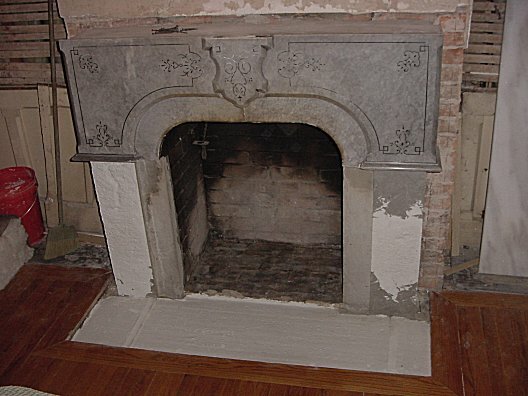 The fireplace wall was also incorporated into the frame in preparation for the new walls that will be coming soon. This is a picture of the finished frame. This time it has the proper edge support for the sheetrock to be mounted securely. And finally, up goes the sheetrock. 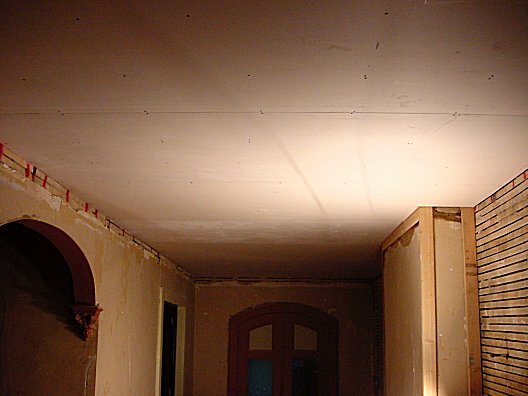 Other than the tape and fill, this is one perfectly flat ceiling that will last for many years to come. Yipee! Remember this? 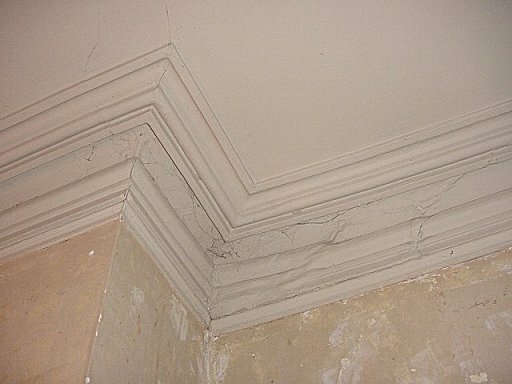 In order to replicate the look of the original plaster moldings, we referred to the originals. 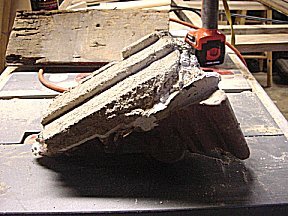 When doing the demolition of the hall, we saved a few of the larger pieces of plaster molding. 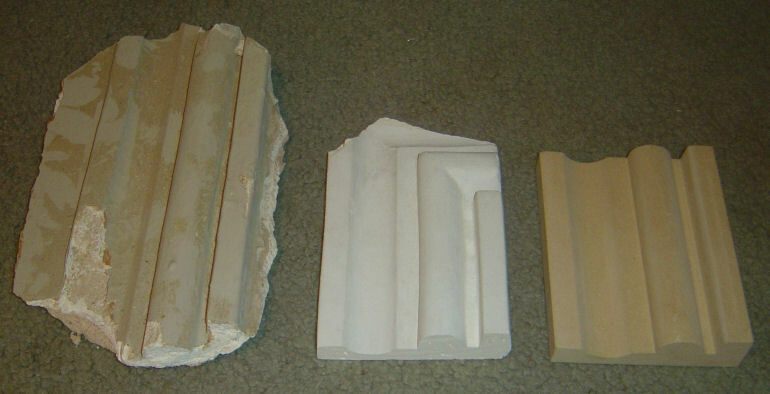 The piece on the left is a chunk of the plaster moldings taken from the rubble after the demolition. 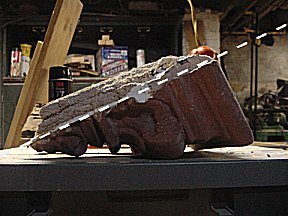 The piece in the middle is also an original piece that was carefully stripped and cut to reveal the original profile. 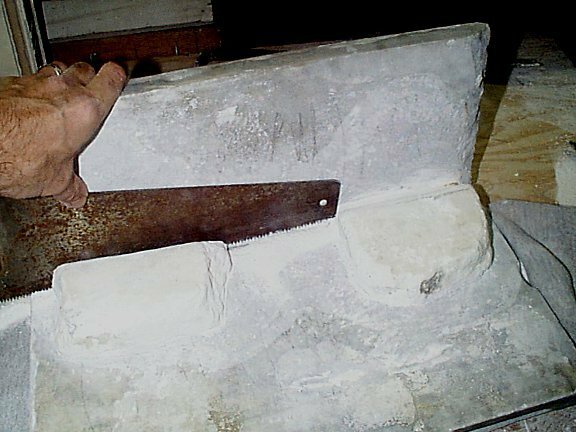 This was then taken to a molding manufacturer where they made a molding knife in the exact same profile and produced a copy out of ultra light material. 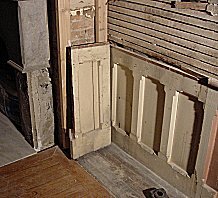 The piece on the right is a sample of the replicated moldings. Cool stuff! 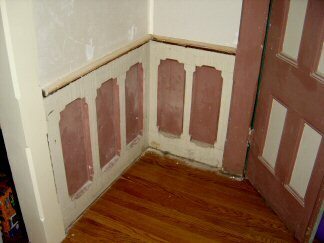 Here is a back to back comparison of the original plaster moldings to the replicated copy. Once painted, there is no difference. A friend of mine works building movie sets. 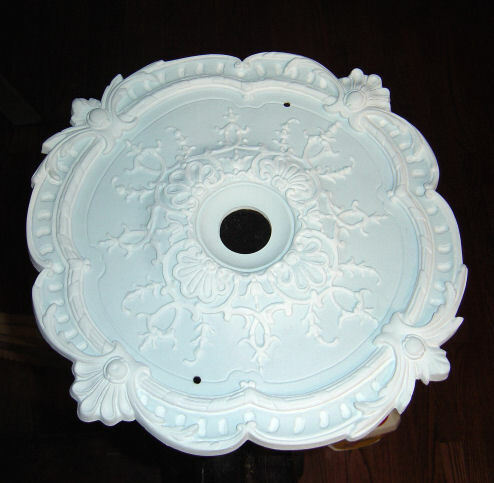 He brought me this resin cast of an original ceiling medallion. 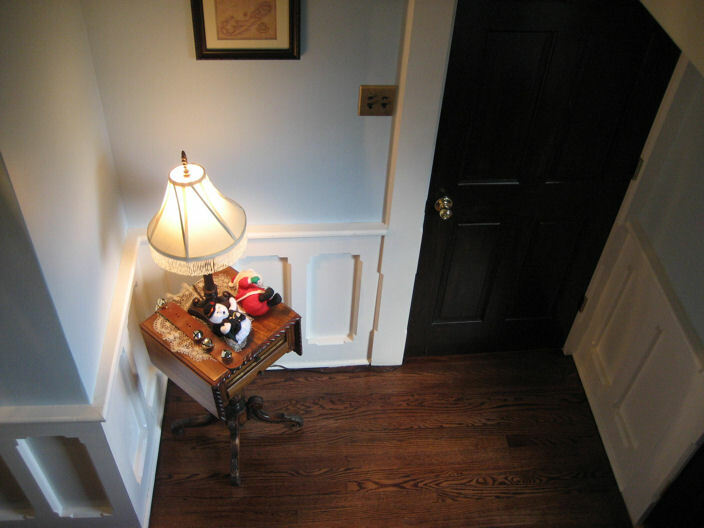 It is only 18" in diameter, just perfect for this hallway. The ceiling is fairly narrow where this will go and we don't want anything too overstated. The Reception hall has no windows and is only lit from within, so we felt it was important to paint the room in light colors. The ceiling and trip will only be off by a few shades to show details. I spent a few nights in front of the TV with some artist's brushes and painted this in ceiling flat paints. This will look great when installed. 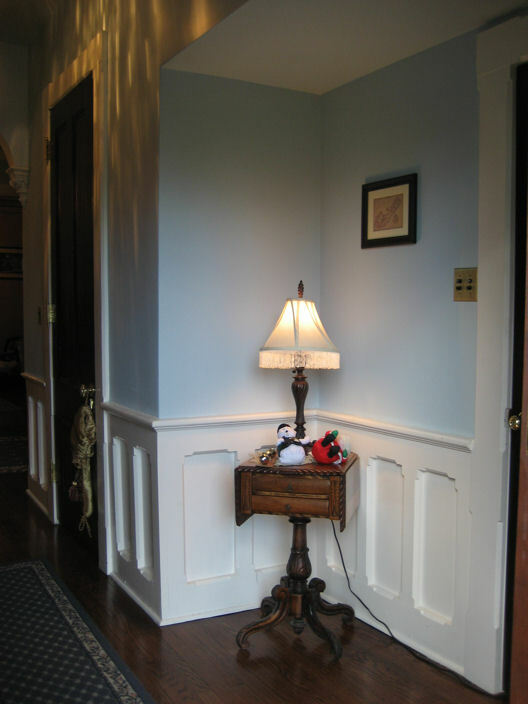 The woodwork is one of the most dramatic features of this grand old hallway. It will require lots of patience to restore. 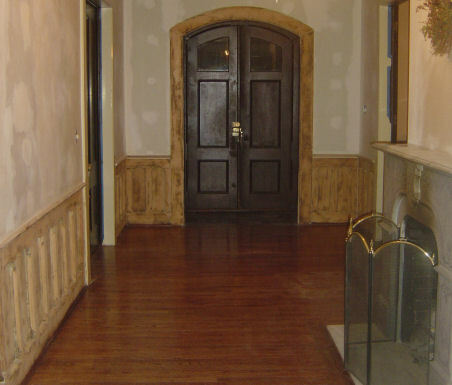 The woodwork was originally faux painted in the 1890's to look like English Oak. 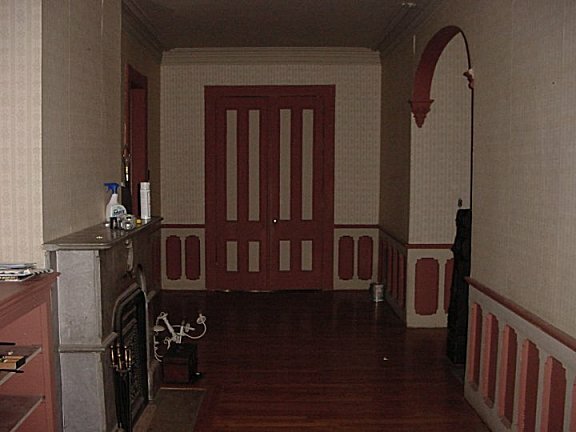 The dark woodwork fell out of style in subsequent years and was painted over. 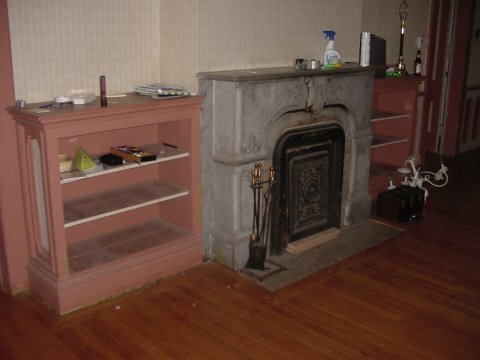 A set of book cases were added flanking either side of the fireplace. We believe this was done in the 1920's. The quality of these bookcases were poor at best. They really take away from the flow of the hall and make it look crowded. These are not original, so they have to go. The wood panels were hacked up to make the book cases fit. Lucky for us, they did not remove the panels, rather just built over them. Certain parts will need to be replicated where there is damage. Then the floor will have to be matched as a new floor had been installed around the book cases. These end panels are beyond repair. Special lumber will have to be milled to match the thickness of these panels. Using this lumber I will create replica panels to replace the damage. Once the woodwork is refinished, it should blend right in. This is a lot of work combined into one picture. The damaged panel from the picture above was replicated and installed. 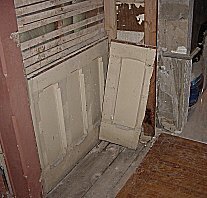 The longer, existing panel, was stripped down to bare wood. Damaged pieces replicated and replaced. 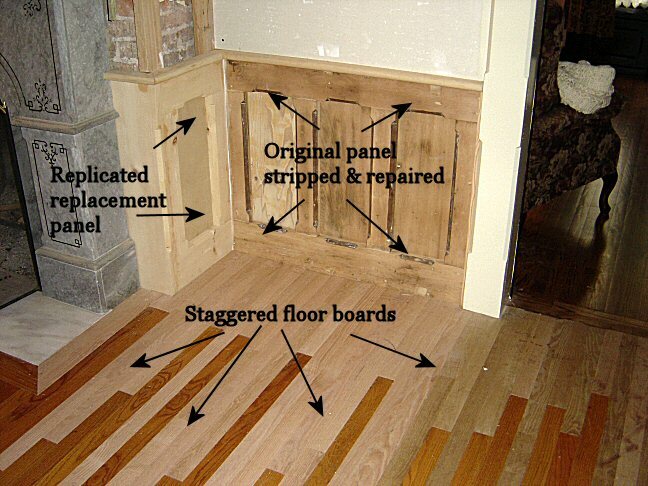 In order to fill the hole in the floor where the bookcase was, the existing floor boards needed to be removed in a staggered pattern and replaced filling the gap. 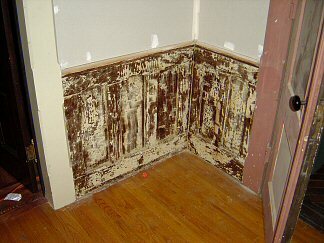 Once sanded and stained, it will look like this never happened. Meet my Mother-in-law. This is Chris. 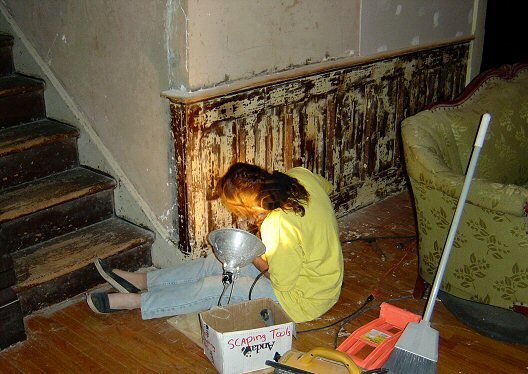 She claims that she actually "likes" to strip paint off of old woodwork. Normally, I wouldn't believe such a thing, but give this lady a heat gun and a box of scraping tools, and you just can't get rid of her! She is my secret weapon. No, she is not for hire, she's mine folks, all mine! It starts off looking like a bad day in 1977 and just gets worse. The bottom coat of paint is the kryptonite of paints, it's Milk Paint. They should coat military vehicles with this stuff. Nothing kills it. After the heat gun, the old paint is so dry it basically turns to powder when sanded. Okay, here it is! 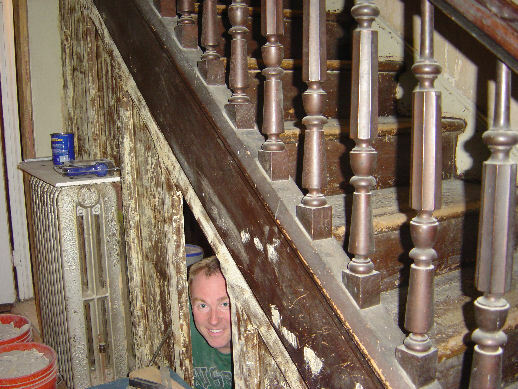 The sanded hallway. I can't begin to express how much work it took to get it to this stage. We could probably just leave it like this and be happy, because it looks beautiful just being done! Now it is ready to seal/prime and begin the faux process on all this wood. But this is when the room starts to look nice, so while there is a lot more work ahead, it won't be as dusty and nasty. Yippee! 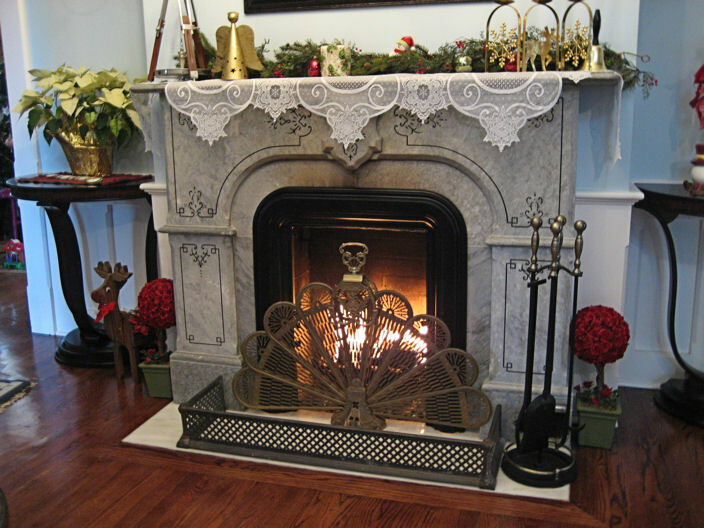 The Reception Hall fireplace is one of the prettiest fireplaces in the house. 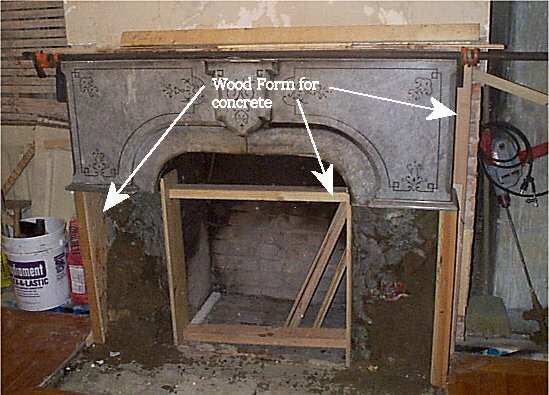 While being a fully functional wood burning fireplace, it has some serious cosmetic issues that date back to when the house was built. 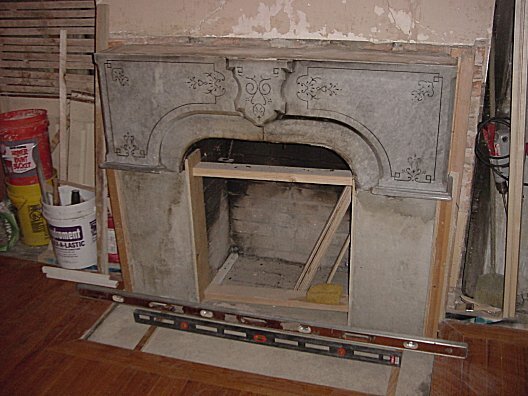 My fireplace guy John Longo and I started by removing the top Mantle shelf. This was pretty easy. We wiggled it back and forth a few times and off she came. John then proceeded to grind out the old grout and pull pieces out one by one. 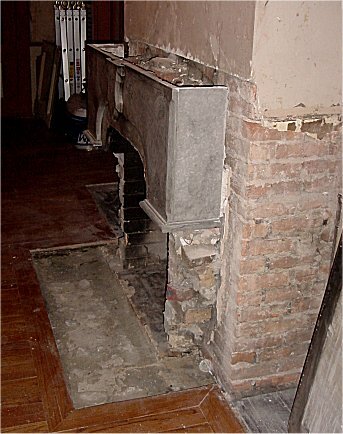 After about an hour the lower half of the fireplace was removed and all the pieces safely put aside. 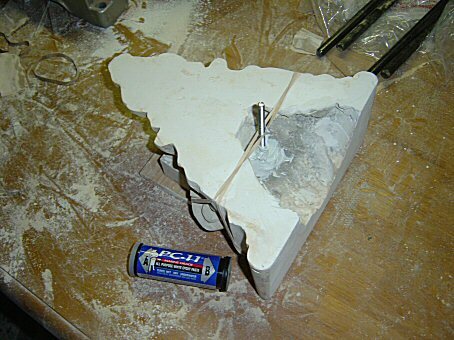 We then went to work on the concrete support structure that was behind the marble pieces that we had just removed. This was where I joined in the fun with a rock hammer. After all of the loose support structure was removed, it was time to remove the ugly brick. I think I enjoyed this more than anything. 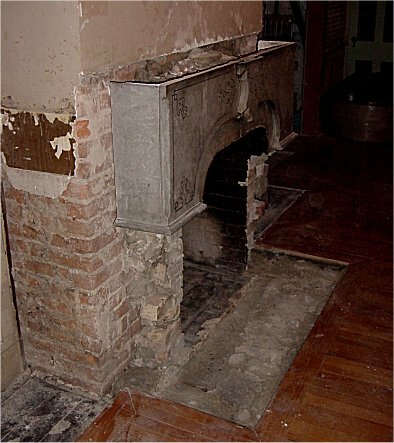 That brick had no right to be in this fireplace, and I have been dying to get rid of it. Another hour goes by, and bye, bye ugly brick. John took over from here, he spent the next hour removing the old hearth stone. 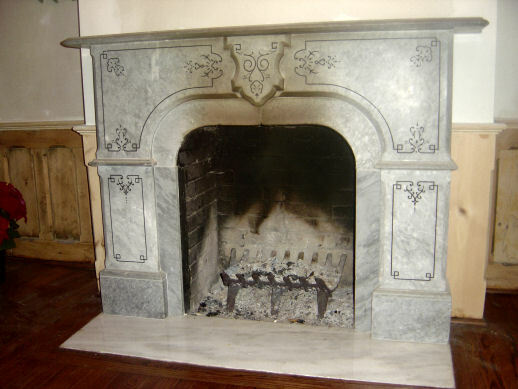 We learned from when we restored the Parlor Fireplace that the hearthstone is actually white marble. Unfortunately it was neglected over the years and the marble was deeply stained. This stone has to go. We will have an exact replica made to replace it. From looking at the pieces, we have been able to determine that the corners were all pre-assembled in Italy and shipped as a pre-assembled kit. 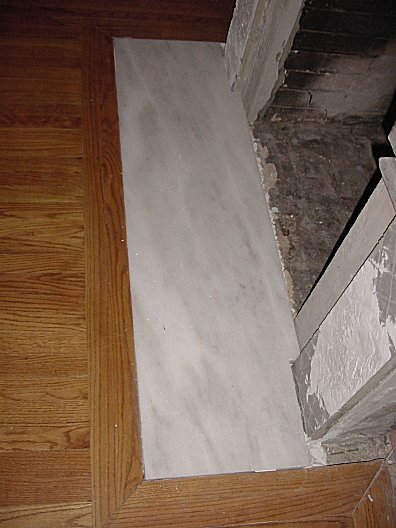 This picture shows the back side of two of the removed marble corners. We intend to mount all of the marble pieces to a smooth concrete surface when we rebuild. This means all of the corners must be disassembled. John, went to work with assorted weapons of destruction to remove the bonding materials and actually found scrap marble pieces were used for support. This process had to be repeated over and over again. A daunting task to say the least. 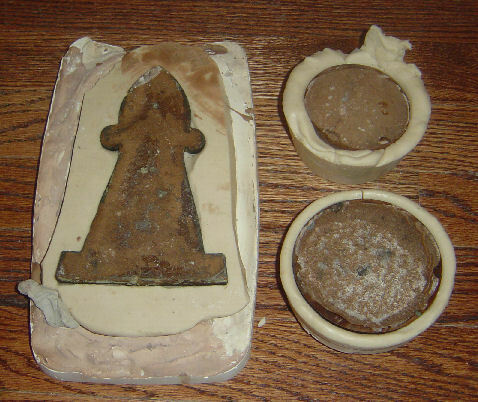 This photo shows the bottom pieces that have layers of old floor wax, and varnish from years gone by. Yuck! 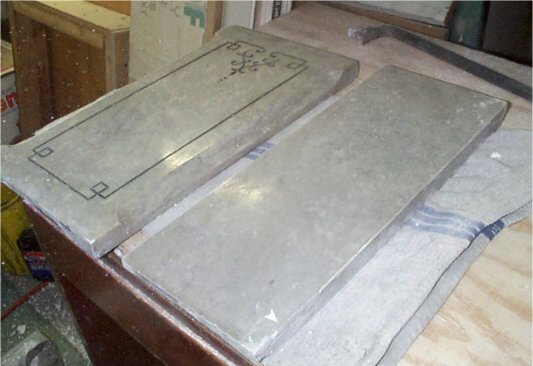 Unlike the original, we have chosen to construct a solid concrete substructure to apply the marble plates to. 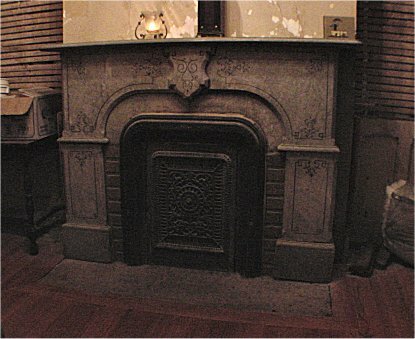 In fact we are planning to fill the entire mantle with concrete to ensure it's permanent stability. John created wooden concrete forms that are actually hand pressed together. This will ensure that they come apart with ease leaving a perfectly smooth bonding surface behind. 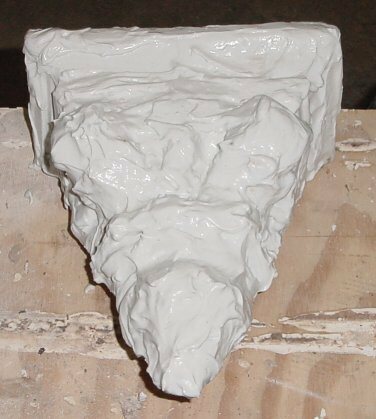 Being this is a vertical surface, concrete will be added in layers. Here you see the mantle has been filled to the top, and is ready for the mantle shelf to be installed. 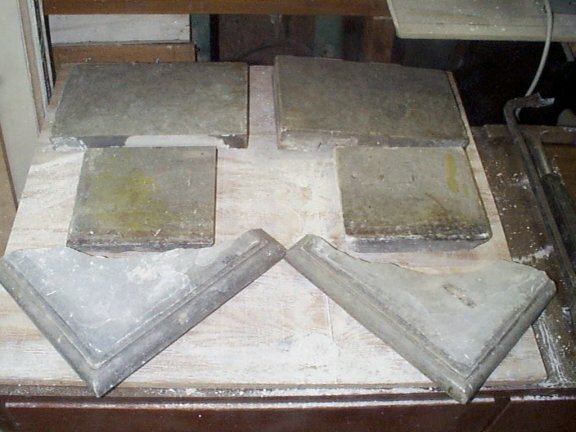 The concrete has been built out to a smooth surface. The hearth section has been filled with concrete. 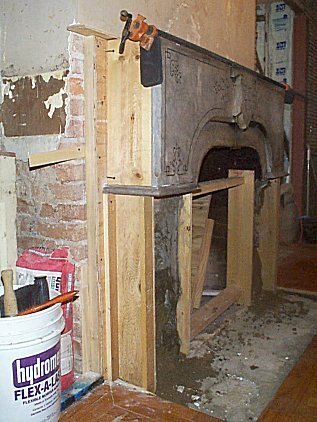 It has also been carefully fitted with wood strips that will keep the new hearth stone are the proper height when installed. The new marble hearth stone is installed even with the floor. Not the greatest picture I have ever taken, but this is after we finished reassembling the marble. Note no more alignment issues and no more ugly brick (that didn't match). 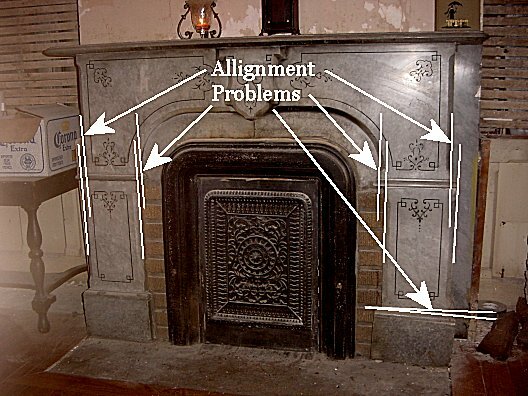 This is how this fireplace was intended to look in 1890. Now we just have to restore the frame and Summer cover and we are in. From the smoke marks you can see that we have been enjoying this fireplace while working on the hall in the winter months. 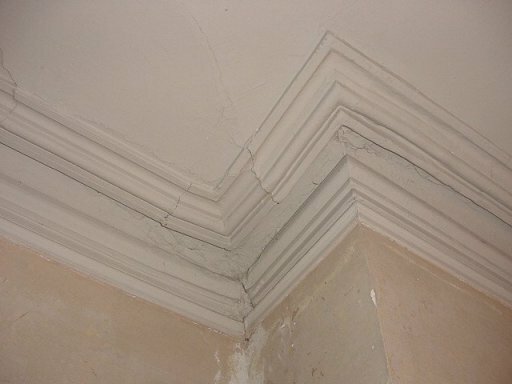 These are solid plaster Corbels. 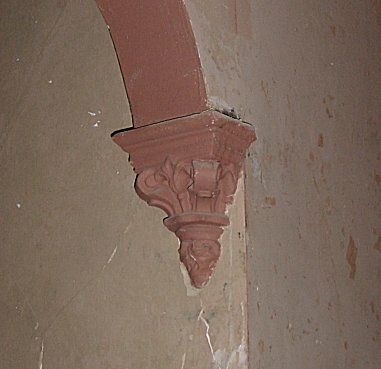 In the 1890's, the plaster workers would actually attach the corbel to the wall and plaster the wall around it, making the Corbel a literally part of the wall. This makes restoring them quite interesting. 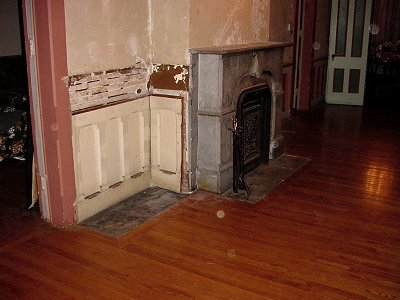 The walls surrounding these little beauties, are in need of re-surfacing and the corbels themselves need to be restored. Wiggle it gently, back and forth like a loose tooth, and pull! The picture on the left shows the wall still attached to the newly liberated corbel. The picture on the right represents what needs to be painstakingly removed from the back of the fragile piece of ornamental plaster. 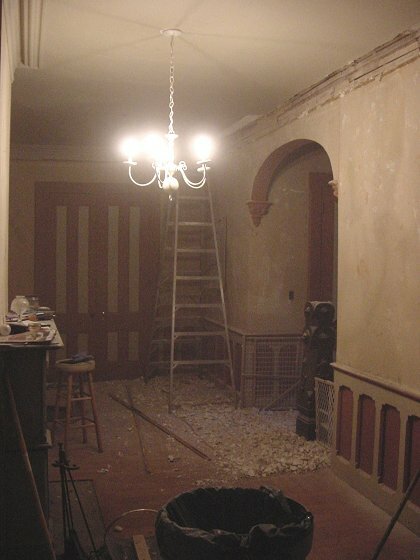 Once the wall debris was scraped off the back, it was time to remove the six coats of paint from the plaster. I use Peel-Away 1. It works really well for this kind of application. All you do is apply it like putting Icing on a cake. 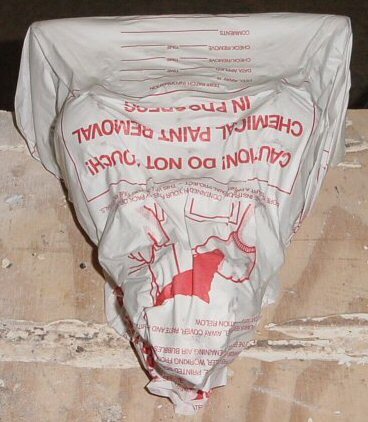 Wrap it up with the supplied paper and leave it for 24 hours. It removed all six layers of paint leaving the plaster unscathed. Try and follow me here. 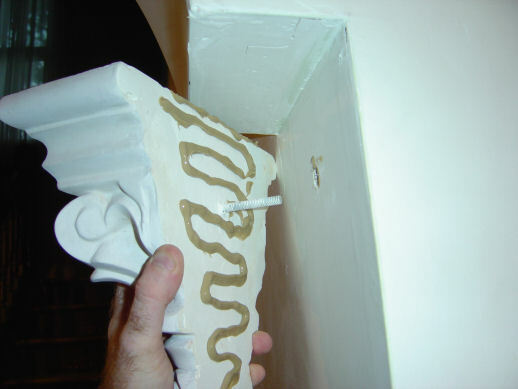 When I re-install the corbel, it will be glued in place. In order to give extra support during install, I mounted a carriage bolt to the back using a two part epoxy. During installation, I will drill a hole in the wall (and supporting stud) that the bolt will slide into, helping to hold the corbel steady while the glue dries. 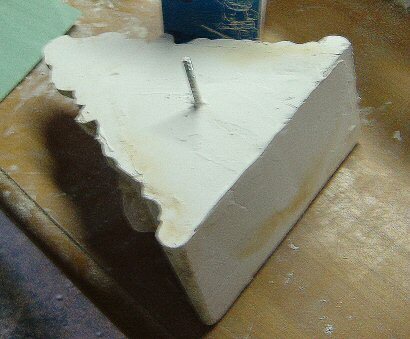 Next, I mixed up some plaster and filled the back and top to be square. This will give the corbel more bonding surface when I install it. 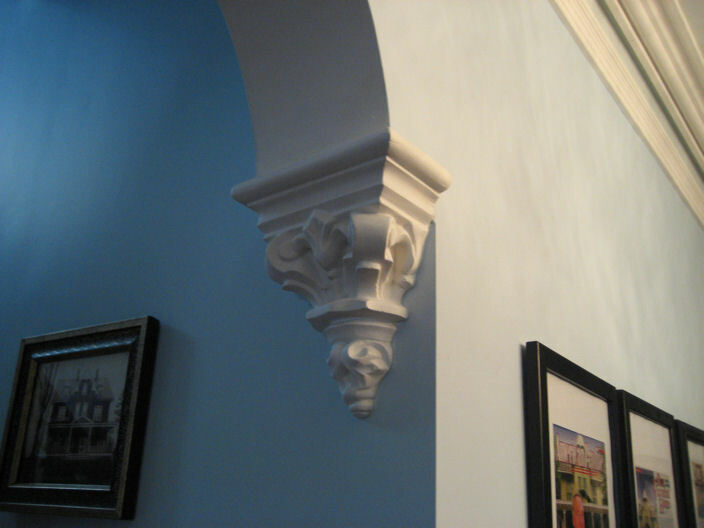 After a few (very tedious) hours of detail sanding, the corbel is now fully restored and ready to be re-installed. Now you can see where the bolt in the back of the corbel comes into play. I drilled a hole in the wall that lies up with the bolt. Then I applied a generous amount of construction adhesive and pressed the corbel into place. The bolt won't hold it on it's own but it gives support along the wall side so it won't slip while drying. Then I temporarily screwed hooks into nearby studs on either side and hung a ratcheting strap. 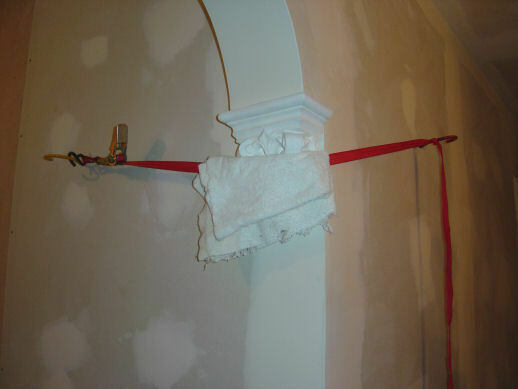 Protecting the corbel with a towel, I ratcheted the strap tightly pressing the corbel into it's permanent place. 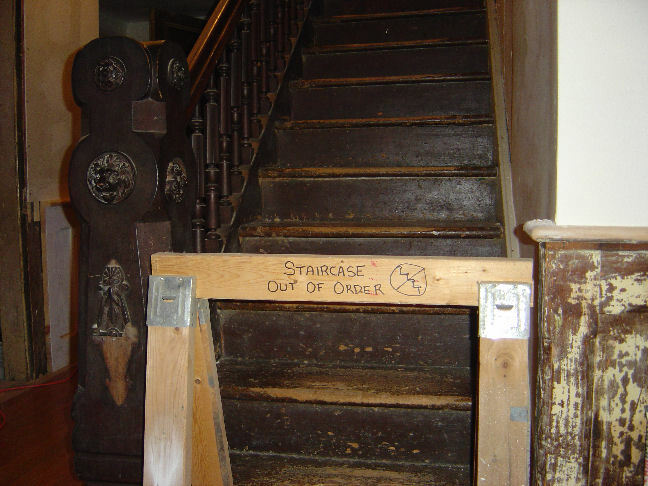 Well, as we continued to work on the hall we came to the realization that the Master Staircase had become completely unstable and unsafe. Steps were moving as you went up the stairs. A little scary to say the least. As you can see this was a problem that could not be ignored. Thank God we have a back staircase. So, I know better than to try to fix a staircase myself. This requires a professional. 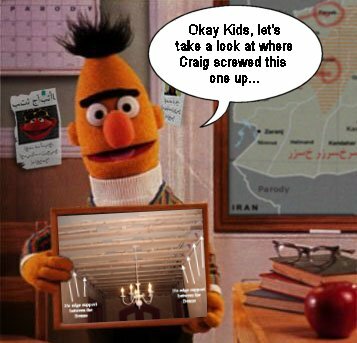 I ended getting an old school European staircase guy to come take a look. 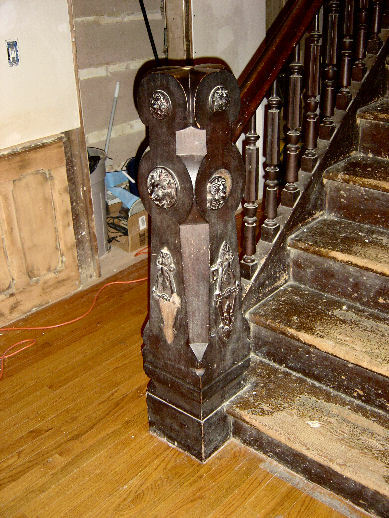 The good news is that the staircase may be ugly, but it will be easy to fix. 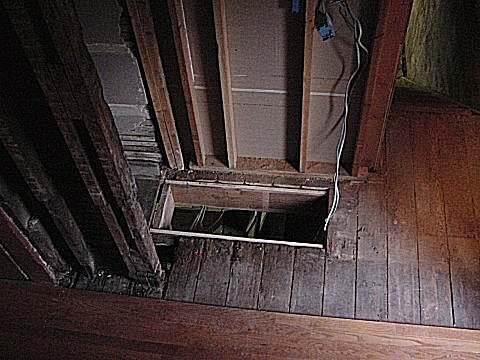 The bad news is that the bathroom under the stairs had to be completely ripped out to allow access to the underside of the treads. 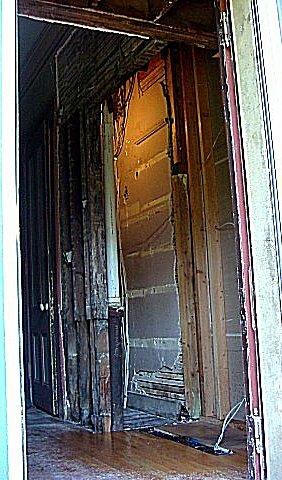 While this news was not pleasant I knew that this ugly little bathroom need to be gutted anyway, so what better time than now? But we will get back to that later. This picture was taken (obviously) after ripping out the bathroom. My Staircase guy was amazing! He started by scraping, cleaning, and vacuuming every crevice to be perfectly clean. Then, step my step he pounded wooden shims into the edges of all of the treads and risers. He then, machine screwed galvanized screws through the backs of the risers into the treads. He kept checking each step for creaks as he went along and made adjustments. He finished by shooting construction adhesive into all the seams. 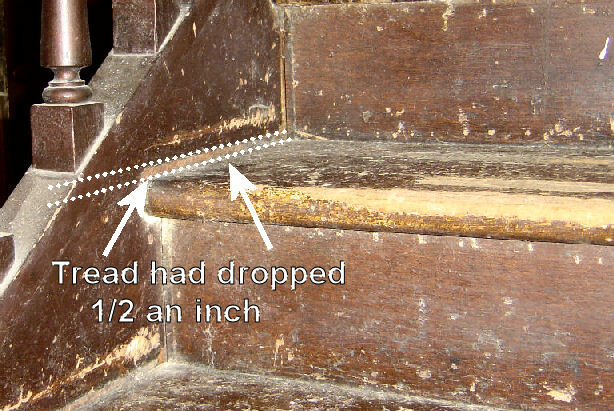 The result is one very solid staircase that doesn't have a creak or squeak anywhere. 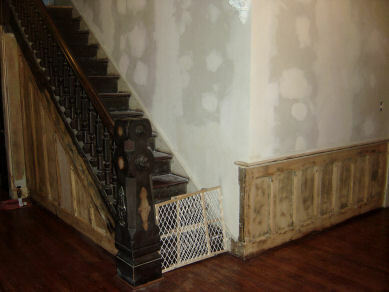 While the staircase was open from the back, I replaced two cracked panels along the paneling under the stairs. 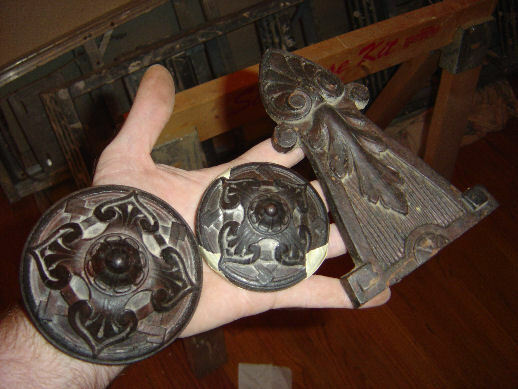 Very carefully, I slowly removed these carved pieces, so I could have replacement pieces made for the damaged parts. These are the good pieces. 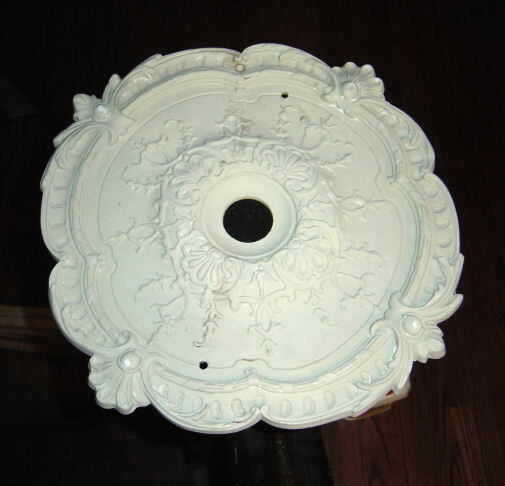 Once the molding compound dries, the original is removed, leaving a perfect mold. 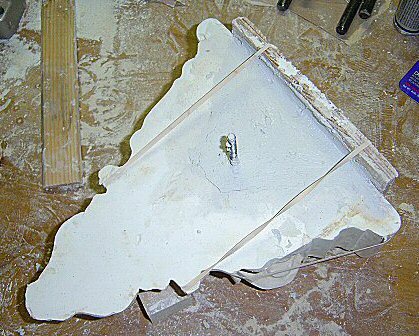 The mold is then sprayed with a mold release agent and is filled with a liquid composite mixture and again allowed to dry. What later emerges, is a perfect copy of the original piece. For the record, the pieces on the left are the copies and the rights are the originals. 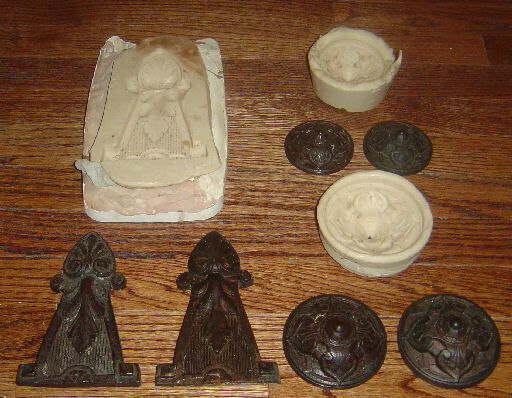 please note that these pieces have also been color treated and rubbed with a bees wax to match the aged appearance. The Side Hall is an extension of the Reception Hall. 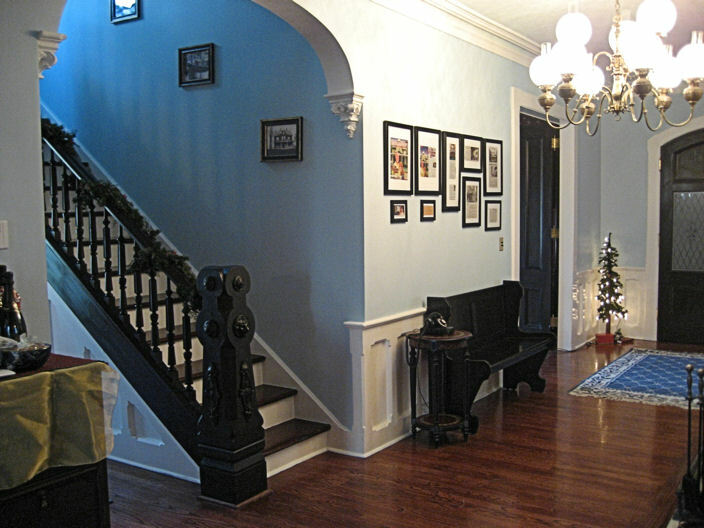 This hall houses the main staircase, entrance to the basement, a half bath and a large hall closet. 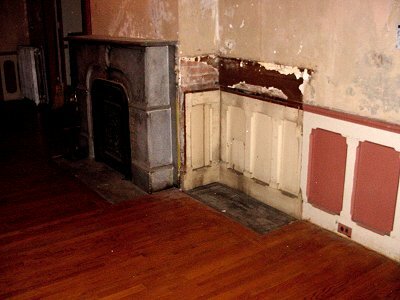 The half bath once served as a servant's passageway to the front parlor. This hall is damaged well beyond any hopes of repair. This will have to be demolished and restored. 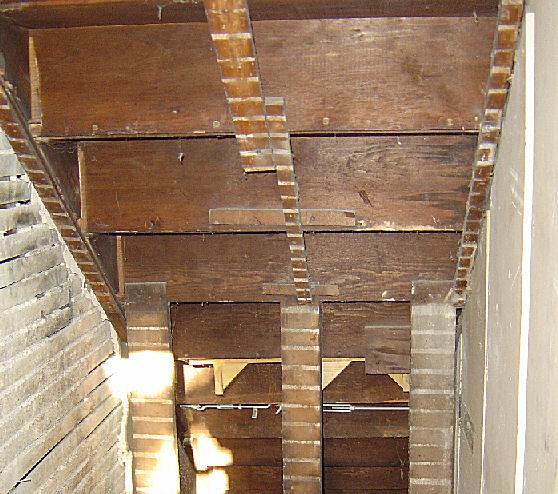 This small hallway leads to the side entrance of the house. We kinda knew this was going to be a project within itself from the start. Some time last year, we were leaving to go out to dinner when we walked out the side door and closed it behind us, that is when we heard a large crash. We opened the door to see that the a section of ceiling in the side hall had collapsed onto the floor. We just shut the door and went out to dinner. Upon further investigation, it became apparent that there had been a leak coming from the bathroom above for many years. 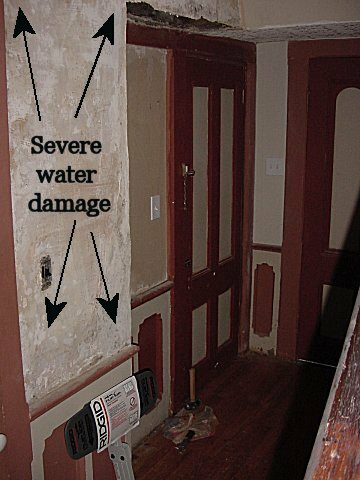 You could see where the walls had been patched multiple times and the water had seeped through the repairs. The walls were destroyed. So, it was time to remove the walls to see how extensive the damage really was. 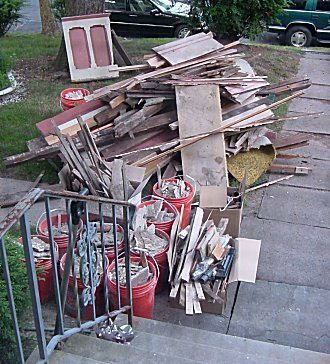 I kept removing rotted debris, and more rotted debris! It was much worse than I had anticipated. 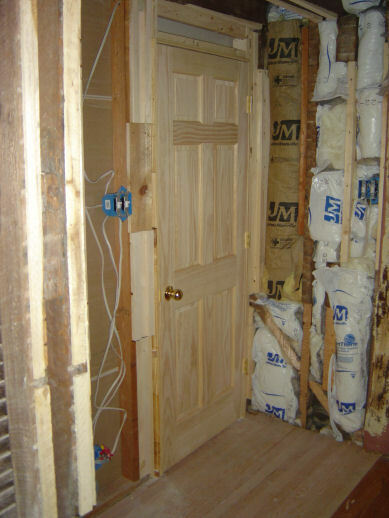 There were 4x4 timbers that made up the closet wall that were reduced to a Styrofoam consistency. I was literally able to snap them in two by just pulling on them. The debris pile just kept growing as the day went along. After cleaning up, I really was able to closely examine the damage area. It looks as though the leak must have been there for at least ten years! 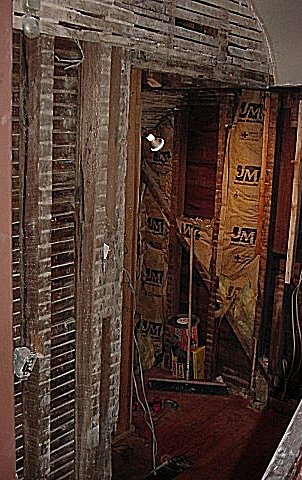 Once I was done removing all of the rotted wood and damaged plaster, the path of the water damage actually extended from the second floor bathroom, into the basement! 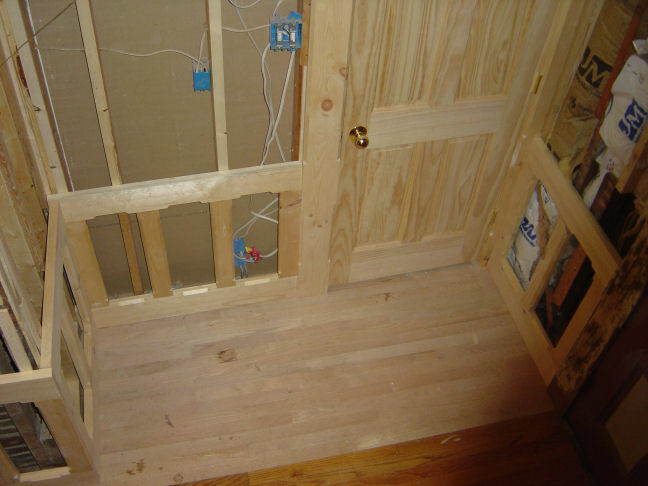 Subsequently, the flooring had to be pulled up because the sub flooring was rotted and unsafe. 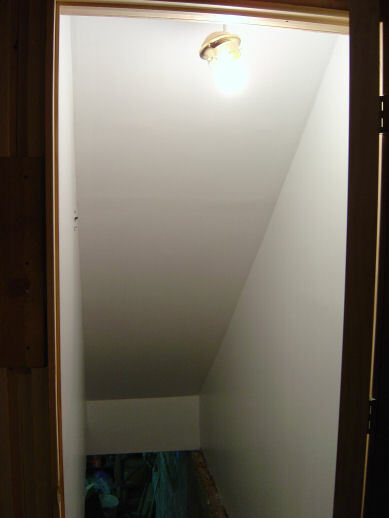 From this spot, if you look down, you can see the basement, if you look up, you can see the bathroom on the second floor. Moral of the story...if it leaks, fix it. It won't fix itself. Lots of work here. New subfloor, new solid oak flooring, new frame. New doorframe and six panel door, and of course the obligatory insulation on the exterior wall. Next, I started replicating the panels that wrap the entire hallway. I had to have special lumber milled to the right thickness (expensive) I made up all the parts and added the lamb's tongue detailing. I decided to assemble the frames in place this time. Much easier to make frames that follow this "out of square house" then trying to trim them later.